Old Bakelite / Faturan for $50 per gram! Check out eBay 283320775714, which asks $16,200 for a 324 g necklace ($50/g) - much more than what is usually asked for old amber! 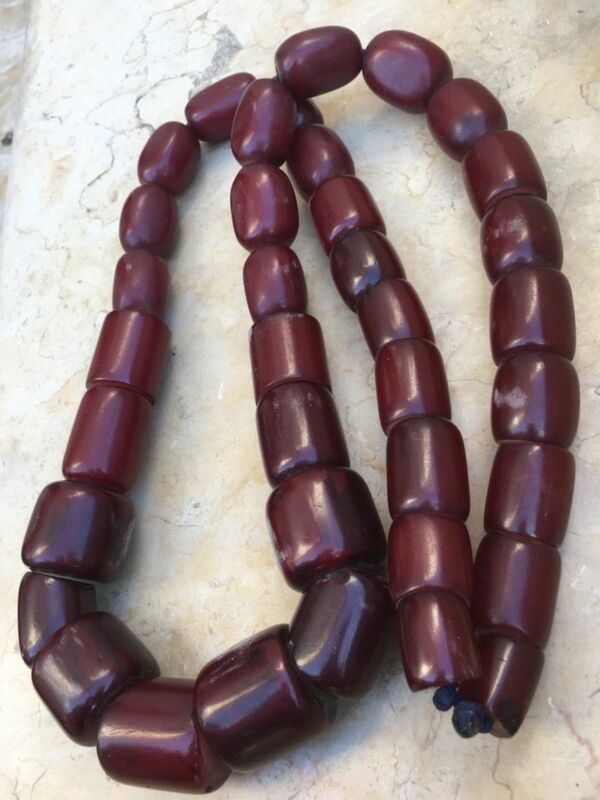 The seller also says the beads are over 150 years old, which is impossible since the first production of Bakelite - the first phenolic resin - was in 1910. Note that Faturan was a trade name for one of the early German versions of phenolic resin. The earliest reference I could find to Faturan was in 1923, although one online article claimed that there was a mention in 1917. I have not seen this documentation myself, and the author died a few years ago before I could ask him about it. Also note that there is no way to prove which of the many manufacturers of phenolic resin made the material in any particular bead. Many of the early formulations had the same chemical instability that caused amber colored beads to turn this deep red-brown, sometimes after a matter of weeks. I've been running an experiment in my office on the color change of old phenolic resin beads. I broke an old cherry red, faceted bead into pieces, and observed that the red color was in a very thin outer layer, no more than a millimeter, while the inside of the bead was clear amber. Over the last 2-3 years, the freshly exposed amber surfaces have slowly gotten redder and redder.